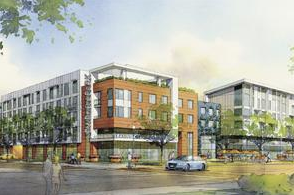 The first market-rate apartments near the Berryessa BART station are about to break ground! Called LINQ at Berryessa, the project will have 230-units and is sitting on land that used to be zoned as industrial. Two affordable projects have already been built in the area and another 140-unit market-rate project is going to be built a kitty corner from LINQ. In addition to being a short walk away from BART, LINQ will also have 12,000 SQFT of retail space which will likely be used for restaurants. For more info, hit the source link below.